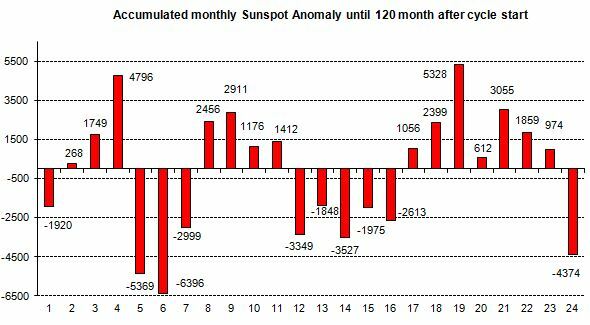 On 16 days the sun was completely “spotless”. The maximum number over the days of November was 15, which does not mean that there were 15 spots – no, the number indicates that 5 spots were observed in a maximum of 1 spot group. So there was very low spot activity, only 20% of the average value. Fig. 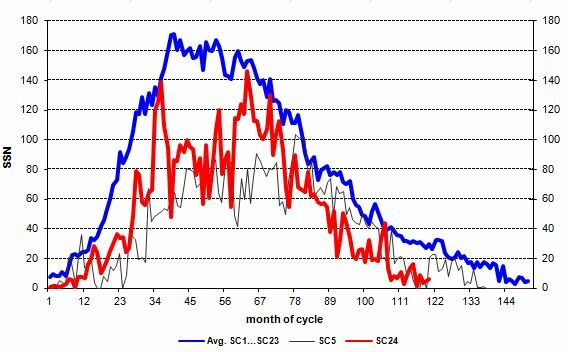 2: The summed up monthly deviations between the observed SSN numbers and the respective mean value (blue in Fig.1) for all cycles up to the current cycle month 120 of SC 24. Fig. 3: The temporal development of the polar solar fields of the sun since 1980. 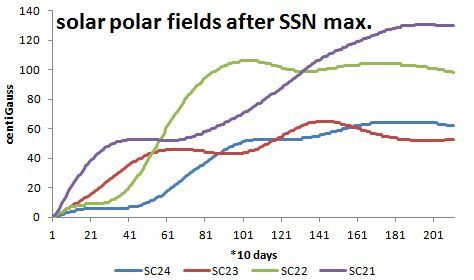 The strength in the spot minimum, at the end of the respective graph when the fields become stationary and hardly change, is a good indicator for the activity of the subsequent cycle.